More than two decades ago, experiments on the antiviral mechanisms of IFNs led to the discovery of JAKs and their downstream effectors, the STAT proteins. This pathway has since become a paradigm for membrane-to-nucleus signaling and explains how a broad range of soluble factors, including cytokines and hormones, mediate their diverse functions. Jak/STAT research has not only impacted basic science, particularly in the context of intercellular communication and cell-extrinsic control of gene expression, it also has become a prototype for transition from bench to bedside, culminating in the development and clinical implementation of pathway-specific therapeutics. This brief review synthesizes our current understanding of Jak/STAT biology while taking stock of the lessons learned and the challenges that lie ahead. Metazoans, and even unicellular aggregates, must coordinate the diverse activities of cellular hordes to achieve collective goals. This imperative underlies two fundamental questions in biology: how do individual cells sense external cues and, in turn, how are these external cues interpreted to program behavior? Evolution has provided a number of elegant solutions; among these, the Jak/STAT pathway has emerged as a paradigm, as evidenced by its conservation across phylogeny from vertebrates to lower organisms like Dictyostelium (1). Not surprisingly, the study of this ancient pathway has yielded fundamental insights about cellular communication and the role of membrane-to-nucleus signaling in controlling gene expression. It also has shaped our understanding of the mammalian immune system, perhaps the most intricate of all cellular networks, and provided both the impetus and rationale for pathway-specific therapeutics. This brief review discusses current theories on how Jak/STAT signaling works at the cellular, molecular, and genomic levels, with particular emphasis on human disease. Our aim is not to be expansive but, rather, to highlight emerging ideas and to present a modern view of Jak/STAT research as it strides forward into its third decade. The biochemistry of Jak/STAT signaling has been studied extensively (2). Briefly, signaling begins with extracellular association of cytokines or growth factors with their corresponding transmembrane receptors. This facilitates trans-activation of receptor-bound Jaks by putting them in spatial proximity and by prompting conformational changes that distance their kinase domains from inhibitory pseudokinase domains (3). Activated Jaks then phosphorylate latent STAT monomers, leading to dimerization, nuclear translocation, and DNA binding (Fig. 1). In mammals, four Jaks (JAK1, JAK2, JAK3, TYK2) and seven STATs (STAT1, STAT2, STAT3, STAT4, STAT5a, STAT5b, STAT6) are used by >50 cytokines and growth factors, raising the question of how specificity is achieved with so few building blocks. One explanation is that specificity is lineage dependent, meaning that cytokines that activate the same STATs may operate on different cell types (or states), each with distinct panels of STAT-sensitive genes. However, this does not explain why cytokines that “look” similar in terms of STAT-signaling cascades can have different outcomes within the same cell type or state. A classic example of this dichotomy is the case of IL-6 and IL-10; both are potent STAT3 activators in myeloid cells, but the former exerts mostly proinflammatory effects, whereas the latter is mostly anti-inflammatory. There is evidence that qualitative differences in the duration and or intensity of STAT3 signaling underlie the disparity, but this may not be the whole story (4). Another point to consider is that, although each cytokine is traditionally associated with a particular STAT, almost all engage more than one family member to varying degrees (i.e., heterogeneous signaling; Fig. 1). For example, type I IFNs are prototypical STAT1 activators but also activate STAT3 and STAT4 (5). In some instances, cytokines engage multiple STATs with comparable potency, as with IL-27, a strong activator of both STAT1 and STAT3 (6), whereas in others there is clear hierarchy, as with IFN-γ, which elicits a strong STAT1 response coupled to a relatively weak STAT3 response (7). This heterogeneity is philosophically satisfying because graded combinations of STATs may contribute to cytokine specificity, although it is also unlikely that such quantitative differences account for all of it. Canonical Jak/STAT signaling begins with the association of cytokines and their corresponding transmembrane receptors. This brings Jaks in proximity, leading to phosphorylation of both the Jaks themselves and the cytoplasmic tails of the receptors, creating requisite docking sites for latent STAT monomers. STAT p-Tyr then proceeds as the major activating event, leading to dimerization, translocation, DNA binding, and target gene induction. Noncanonical deviations from this model also should be considered. First, p-Tyr can occur via Jak-independent pathways and, in fact, is not required for some activities (unphosphorylated STATs). Additional posttranslational modifications (e.g., p-Ser) also can influence STATs. Next, although each cytokine/receptor is typically associated with a particular STAT, most engage more than one family member (heterogeneous signaling), leading to the formation of homodimers, as well as heterodimers and higher-order tetramers. These migrate to the nucleus where they bind to DNA through consensus GAS elements, as well as through GAS-independent mechanisms, leading to induction, repression, or neutral binding of protein-coding (mRNAs) or noncoding (miRNAs and lncRNAs) target genes, typically as part of multimolecular complexes. Because of a shared affinity for GAS motifs, multiple STATs may bind to the same target sites (overlapping specificities). They also can bind to and promote remodeling of gene enhancers and regulate the epigenetic status of target genes. Lastly, extranuclear functions have increasingly been recognized, most notably in the mitochondrion. It is well established that STATs can bind directly to DNA, thus acting as classical transcription factors (TFs). Exactly where and how they bind are matters of ongoing debate. Traditionally, these questions have been addressed using low-throughput, candidate-driven approaches but, with the advent of next-generation sequencing, it is now possible to tackle them on a genome-wide scale. Most notably, deep sequencing can be coupled with chromatin immunoprecipitation to produce comprehensive, unbiased maps of STAT–DNA binding that can be integrated with transcriptomics and loss-of-function studies (i.e., “knockout” mice, small interfering RNA) to catalog target genes that are subject to both STAT occupancy and STAT-dependent transcriptional regulation (8). This methodology was first applied to STAT1 and has since been used to interrogate each family member (9). The emerging theme is that STATs disperse throughout the genome and regulate transcription of both protein-coding and noncoding genes (10) (Fig. 1). Genome-wide analyses have yielded a number of surprises about STAT biology. First is the pervasive nature of STAT binding. In Th cells, thousands of binding sites have been mapped for each family member, sometimes proximal to transcriptional start sites, as would have been predicted, but more often distal, typically associated with enhancers or other cis-regulatory elements (10). Many of these binding events are not associated with consensus DNA motifs (i.e., IFN-γ activation site [GAS] elements), which suggests either degeneracy in the recognition code or alternative targeting strategies (11), and many do not correlate with changes in gene expression (Fig. 1) (12, 13). This latter phenomenon, sometimes referred to as “neutral” or “opportunistic” binding, is typically underemphasized in genome-wide profiles. Another unexpected finding is the high degree of overlap between different STATs (i.e., overlapping specificities; Fig. 1) (14). It is now apparent that many sites (and or genes) can be bound by multiple family members, although it also should be noted that each STAT has nonredundant functions, which implies that unique targets are still highly relevant. It has long been known that all STATs recognize the same DNA sequence, known as the GAS motif. There is some selectivity in the core nucleotides preferred by each family member—and STAT6 prefers an extra spacer nucleotide—but all STATs can engage each other’s “optimal” binding sites, albeit with variable affinities (7, 15). This provides a tidy explanation for the genomic overlap between individual STATs and, in turn, for why some genes are regulated by multiple family members. A singular consensus motif also led to the idea that STATs may antagonize one another by competing for access to the same genomic locales. This concept was validated for STAT3 and STAT5: first in T cells, in which STAT3-driven IL-17 transcription is blocked by STAT5, and later in dendritic cells and cancer cell lines (16–18). Further studies are needed to determine whether other STATs engage in this type of head-to-head competition, and the question of how STAT-mediated transcriptional inhibition works—whether it reflects direct regulation of the loci themselves or induction of secondary agents (i.e., inhibitory TFs, microRNAs [miRNAs])—is also pressing. It is undeniable that STATs are critical determinants of cytokine specificity and function. However, STAT-independent signals emanating from cytokine receptors and/or parallel stimuli also contribute, in part, by influencing STAT responses. Recent examples include ITAM-bearing receptors, which modulate STAT1 signaling, and TNFR-associated factor–activating receptors, which modulate STAT3 signaling (19, 20). An important application of deep sequencing coupled with chromatin immunoprecipitation is to correlate TF binding with epigenetics. These two phenomena are intimately linked because, on one hand, TFs are beholden to the epigenetic structure of their target genes, whereas on the other hand, TFs can elicit toggling between “open” and “closed” states, which suggests that they also can be upstream of epigenetic changes (21, 22). Echoing work from other model systems, genome-wide analyses in T cells showed that STATs are both regulators of, and are regulated by, the epigenetic landscape (Fig. 1). These studies affirmed that STAT signaling can drive widespread epigenetic changes, which previously was demonstrated for only a limited set loci (e.g., Ifng, Il4/Il13), as well as provided an epigenetic basis for T cell lineage commitment and plasticity (8, 10, 22). It is also notable that STATs may differ in the way that they influence the epigenetic landscape. For instance, although STAT4 and STAT6 each create “open” chromatin at target loci, the former does so mainly by promoting permissive marks, and the latter does so by limiting repressive marks (12). The exact mechanism by which STATs elicit these changes, whether by recruitment and or transcriptional regulation of the epigenetic machinery, is under investigation. However, a direct link between STATs and repressive marks was described recently in B cells, where STAT5 was shown to recruit the methyltransferase, EZH2, thereby guiding deposition of H3K27me3 at silenced loci (23). As with epigenetic marks, STAT-binding profiles can be integrated with those of other TFs to identify regulatory networks. The key idea emerging from these studies is that STATs are core elements within multimolecular complexes that congregate at transcriptionally relevant DNA elements, such as promoters or enhancers (Fig. 1). Recent examples come from the field of stem cell biology, where STAT3 was shown to be involved in a pluripotency network together with Oct4, Sox2, and Smad1 (24), and from immunology, where STAT3 was shown to be involved in a network together with IRF4, BATF, and RORγt (25). Broadly speaking, STATs participate in at least three types of networks in immune cells: those involved in the general transcriptional or epigenetic machinery, with members including RNA polymerase, p300, methyltransferases and or acetyltransferases (26, 27); those involved in general inflammatory functions, with members including AP-1, IRF, and or NF-κB family TFs (25, 26, 28); and those involved in lineage commitment, with members including “master” TFs that are critical for lineage specification. This latter group (i.e., the “master” TFs) has been studied extensively in T cells, where STATs are known to bind near (and sometimes physically associate with) T-bet, GATA-3, RORγt, and Foxp3, among others. An outstanding question is whether STATs are the pioneers in these multimolecular complexes or just essential components. The answer is likely to be context dependent, varying from gene to gene and across cell types, but one study argues that, in Th cells, IRF4 precedes and is required for STAT3 binding to target genes, making the former a pioneer and the latter a secondary recruit (29). It has long been known that cis-regulatory elements can have a profound influence on gene expression. However, only with the advent of next-generation sequencing technologies has it become possible to enumerate these on a genome-wide scale. Among the most widely studied regulatory elements are enhancers, which are critical for expression of distally associated genes and can be mapped using a combination of epigenetic (e.g., K27ac) and TF-binding (e.g., p300) profiles (21). This approach revealed that global distribution of active enhancers is extensively remodeled during cellular differentiation, thus presenting a defining characteristic, or fingerprint, of lineage commitment (30). Moreover, regions with dense enhancer clusters, termed “super” or “stretch” enhancers, tend to decorate lineage-defining genes, thereby marking areas of the genome that determine cell identity and that, therefore, must be tightly controlled at the transcriptional level (31, 32). The role of STATs in assembling T cell enhancers has now been investigated on a genome-wide scale. These studies confirm the long-standing idea that lineage-specific loci, including Ifng, Il4/Il13, and Il17a/Il17f, are regulated by STAT-bound enhancers, and further demonstrate that STAT-dependent enhancer remodeling is pervasive, affecting thousands of sites throughout the genome (Fig. 1). In many cases, these remodeling events were shown to be independent of “master” TFs, thus positioning STATs as upstream mediators of lineage commitment and cell identity (33). Inherent to next-generation sequencing is the ability to probe genomic regions that are ignored by predictive approaches, including “gene deserts” far from protein-coding genes. This capacity has enabled the identification of hundreds of cytokine-responsive miRNAs and long noncoding RNAs (lncRNAs), many of which can be traced back to STAT-bound loci (Fig. 1) (34, 35). In fact, recent work showed that STATs directly control transcription of lncRNAs (34). One high-profile example is NEST (Tmevpg1), a STAT4-regulated lncRNA that impacts T cell responses (36, 37). It is also noteworthy that STATs can be the targets of miRNAs and lncRNAs. Several miRNAs, including miR-17 and miR-145, and at least one lncRNA, lnc-DC, are known to directly regulate STATs (38, 39). Although Jak/STAT signaling is typically presented as a simple pathway, decades of research have revealed it to be full of intricacy. For instance, although it is widely held that STATs act only as homodimers, they are also known to form heterodimers and higher-order tetramers (Fig. 1). In fact, classic studies demonstrated that a key difference between type I and type II IFNs is that the former elicits STAT1/STAT2 heterodimers (ISGF3 complex), whereas the latter elicits mostly STAT1 homodimers (GAF complex) (2). Other examples subsequently were reported, such as STAT1/STAT3 and STAT1/STAT4 heterodimers, but the functional relevance remains largely unexplored (7, 40). STAT tetramers are also poorly understood. Unlike dimers, which are assembled in the cytoplasm, the bulk of experimental evidence suggests that tetramerization occurs in the nucleus subsequent to the binding of two STAT dimers to adjacent (or tandem) DNA elements. In terms of function, those involving STAT5 have been studied most extensively and are thought to be critical for optimal transcriptional activity (41). STAT1 tetramerization also has been investigated, with recent work demonstrating that it is important for type II IFNs but dispensable for type I IFNs (42). Another common misconception is that the cytoplasmic pool of latent STATs is kept at saturating density. In reality, expression of STAT proteins is tightly regulated, and oscillating concentrations have important consequences, as seen in NK cells, where relative levels of STAT1 and STAT4 determine the response to type I IFNs (Fig. 1) (43). Consistent with this latter point, STAT loci harbor “super” or “stretch” enhancers, which suggests a high degree of transcriptional control (31). The canonical model of Jak/STAT signaling posits that STATs are triggered by Jak-dependent p-Tyr. This is clearly the dominant route downstream of cytokine receptors, but the obligatory role of Jaks has been challenged in other settings. Jak-independent p-Tyr was linked to the STAT hyperactivity seen in many cancers (discussed below) and is thought to play a role in normal physiological processes (Fig. 1). For instance, some receptor tyrosine kinases (e.g., Flt3R) can elicit STAT5 activation without involving Jaks (44). Additionally, the nucleic acid sensor STING was shown to invoke Jak-independent p-Tyr of STAT6, thereby eliciting host-protective antiviral responses, and the pyruvate kinase M2 was shown to invoke Jak-independent p-Tyr of STAT3 in response to metabolic cues (45, 46). The central role of p-Tyr itself, whether Jak dependent or not, also has been scrutinized, and a growing number of functions have been ascribed to “unphosphorylated” STATs (Fig. 1) (2). These are truly unconventional in that they do not require p-Tyr for nuclear translocation and/or transcriptional activity and because they form distinct antiparallel dimers (2). Beyond p-Tyr, several posttranslational modifications can influence STAT function (Fig. 1). The first to be recognized was p-Ser, which regulates a variety of STAT activities, including DNA binding and interaction with accessory proteins. All STATs are phosphorylated on at least one serine residue, often without concurrent p-Tyr, and numerous external signals can induce p-Ser. These, in turn, dictate the identity of the upstream kinases, which include MAPKs, cyclin-dependent kinases, and IKK, among others (2, 47, 48). In vitro studies established that p-Ser is important for transcriptional responses, as seen with STAT4-driven IFN-γ in T cells (49), whereas in vivo models showed its impact on immune function and hematopoietic transformation (50–52). Additional chemical modifications of STATs include acetylation, methylation, and sumoylation (Fig. 1) (2). These can be broadly divided into two categories: those that promote STAT function and those that limit STAT function. Lysine acetylation and arginine methylation can be placed in the first category; the former was shown to promote STAT function through effects on dimerization and transcriptional activity, and the latter was shown to block association with PIAS proteins, a well-known class of STAT inhibitors. However, it also should be noted that the mechanistic basis and biological significance of these findings have been disputed (53, 54). It is generally agreed that lysine methylation plays an important role in STAT function, although there is some discord about whether it is a positive- or negative-regulatory event (55, 56). Sumoylation has been exclusively regarded as a negative regulator, because it was shown to limit the function of STAT1 and STAT5 (57, 58). Another dogma that has been challenged is that STATs are active only in the nucleus. Recent studies showed that STAT3 can localize to the mitochondrion, where it promotes oxidative phosphorylation and membrane permeability (Fig. 1). This effect is dependent on serine, but not tyrosine, phosphorylation and is thought to be relevant in settings in which cellular respiration is altered, such as cellular stress and cancer (59). All other STATs (with the exception of STAT4) have been detected in the mitochondrion, but their function within this organelle has not been rigorously assessed (59). Another intriguing “geographical” deviation involves JAK2, which was shown to mediate p-Tyr of nuclear histones (60). The Jak/STAT pathway is critical for meeting the diverse challenges faced by the immune system, from resisting infection to maintaining immune tolerance, enforcing barrier functions, and guarding against cancer. However, this capacity comes at a steep price. Errant immune responses can inflict great bodily harm and, not surprisingly, exaggerated or protracted Jak/STAT signaling has been implicated in just about every type of autoimmune disease. Therefore, a delicate balance must be reached to allow for both efficient induction of the Jak/STAT pathway when the immune system is called to action and proper diminution when the instigating threat subsides. The following is a brief overview of how Jak/STAT dysfunction impacts human disease. For a more extensive discussion of this topic, along with tables summarizing the role of each Jak/STAT component, we refer the reader to our previous reviews (8, 61). The broad in vivo relevance of the Jak/STAT pathway first became apparent with the identification of monogenic diseases resulting from germline mutations of Jak/STAT-signaling components and associated cytokines/receptors. These rare “experiments of nature” typically exhibit Mendelian inheritance patterns and dramatic phenotypes, including immunodeficiency, susceptibility to infection, and autoimmunity, thus bringing them to the attention of geneticists and immunologists alike (62). A striking example of monogenic disease is the “bubble boy” syndrome (X-linked SCID). These patients suffer from extreme pathogen susceptibility due to a lack of T and NK cells caused by loss-of-function variants of the common γ-chain (63). Based on in vitro studies demonstrating a selective role for JAK3 in common γ-chain signal transduction, it was discovered that a subset of SCID patients harbor mutations in this kinase, thus providing the first demonstration of nonredundant in vivo functions for any Jak/STAT component (64, 65). Analogous phenotypes in IL-7/IL-7R–deficient humans and STAT5-deficient mice have since confirmed the involvement of the JAK3/STAT5 axis, although it also bears noting that humans with mutations of STAT5B are not immunodeficient; instead, they develop autoimmunity that is due, in large part, to a defect in T regulatory cells (62). Following the discovery of JAK3-SCID, a number of additional Mendelian disorders involving Jak/Stat components were reported. These findings emphasize the central role of Jak/STAT signaling in resistance to infection and, in fact, heritable susceptibility was key in identifying these mutant alleles. All of the known STAT loss-of-function mutations can be associated with particular types of pathogens. Patients with STAT1 mutations are prone to mycobacterial and viral infections, those with STAT2 mutations are prone to viral infections, and those with STAT3 mutations are prone to fungal infections (61). Patients with gain-of-function STAT1 mutations are also prone to fungal infections; however, in this case, hyperactive STAT1 appears to limit STAT3-driven antifungal responses (62). In general, STAT-deficiency phenotypes are mirrored in patients with mutations of upstream/downstream mediators, although at least one exception should be considered; those harboring loss-of-function alleles of IL-10/IL-10R, which is upstream of STAT3, are not susceptible to fungi but, instead, present with inflammatory bowel disease (62). They also do not develop many of the clinical symptoms seen in patients with hypomorphic STAT3 mutations, such as hyper-IgE syndrome and developmental abnormalities (i.e., Job’s syndrome). A similar dichotomy is evident in mice; IL-10– and IL-10R–deficient animals develop colitis, whereas those bearing a hypomorphic STAT3 allele common in hyper-IgE syndrome patients do not (66). Adding further complexity, the recent identification of patients with gain-of-function STAT3 mutations highlights the central role of this pathway in promoting autoimmune disease. These individuals develop a spectrum of clinical symptoms, most notably type 1 diabetes, which is consistent with numerous studies demonstrating that STAT3 can drive pathological inflammation in mice (67). Next-generation sequencing has led to an explosion of genome-wide association studies (GWASs) in which disease phenotypes are linked to single nucleotide polymorphisms (SNPs) in affected populations (68). Not surprisingly, GWASs have implicated SNPs within STAT genes in numerous common diseases. Salient examples of this growing list include STAT3 SNPs associated with Crohn’s disease, psoriasis, and ankylosing spondylitis; STAT4 SNPs associated with rheumatoid arthritis, Crohn’s disease, systemic lupus erythematosus, and Sjögren’s syndrome; and STAT6 SNPs associated with asthma (8, 69). As with monogenic diseases, SNPs found in Jaks and upstream cytokines/receptors support the central role of STATs in many of these disorders. Over the past 20 y, the link between Jak/STAT signaling and oncogenesis has become a major thread in cancer biology. It has long been known that STAT hyperactivity can drive cellular transformation downstream of classic oncogenic signals like BCR-ABL, Ras, and Src (70, 71). This hyperactivity, which typically involves STAT3 and/or STAT5, is now considered a defining characteristic of most solid and blood cancers (70). In addition, somatic mutations of the Jak kinases themselves have increasingly been recognized as primary oncogenic lesions. One landmark discovery was the finding that gain-of-function JAK2 mutations underlie myeloproliferative malignancies (72). This work has been informative for disease etiology, as well as in the context of Jak structure; many of the mutations are found in the pseudo-kinase domain, which recently was shown to have catalytic activity and to limit “autoactivation” of Jaks prior to receptor oligomerization (73). JAK2 fusion proteins also have been implicated in hematological malignancies, as have JAK3 mutations (61, 72). Despite notable exceptions, few mutant STAT alleles are associated with carcinogenesis, which suggests that their oncogenic potential is largely secondary to upstream events. In addition to cell-intrinsic effects, Jak/STAT signals can influence the tumor microenvironment via extrinsic pathways. Again, STAT3 appear to be a principal culprit, with numerous studies showing that it can limit antitumor immunity. Among its subversive activities are the ability to promote myeloid-derived suppressor cells and the ability to mediate the signaling of IL-23, a cytokine that recently was established as an important procancer agent. On the other end of the spectrum is STAT1, which is both a critical cell-intrinsic anticancer signal and an important cell-extrinsic mediator of immunosurveillance (71). Therapeutic targeting of STAT signaling – that’s a fact Jak! Given the data implicating Jak/STAT in autoimmune disease and malignancy, it is not surprising that this pathway has become an attractive target for pharmaceuticals. Ruxolitinib, a JAK1 and JAK2 inhibitor with efficacy for the treatment of polycythemia vera and myelofibrosis, was the first U.S. Food and Drug Administration–approved Jak inhibitor. The second was tofacitinib, which blocks JAK3 and, to a lesser extent, JAK1 and JAK2 (74). First approved for rheumatoid arthritis, it is now in clinical trials for a range of maladies, including psoriasis, inflammatory bowel disease, transplant rejection, juvenile arthritis, and spondyloarthropathy, among others (61) (https://www.clinicaltrials.gov/ct2/results?term=Tofacitinib&Search=Search). A third Jak inhibitor, oclacitinib, is now approved for dermatitis in dogs (75), and a number of additional Jak inhibitors, including “second-generation” versions with improved potency and selectivity, are under development. Unlike Jaks, whose kinase domains are a clear pharmacological target, STATs do not have catalytic activity and, thus, present a more challenging objective. Oligonucleotide-based STAT inhibitors, which presumably sequester STATs away from “dangerous” loci, are the most well-developed approach and are undergoing human testing for a number of malignancies (76). Alternative strategies include small molecule inhibitors, which are also in clinical trials (https://clinicaltrials.gov/ct2/results?term=STAT3&Search=Search), and STAT-binding “intrabodies,” which have been investigated only in animal models (77). STATs also can be impacted by drugs that are not pathway specific, such as pyrimethamine, curcumin, and platinum-based drugs, although it should be noted that their effects are likely to be indirect, perhaps reflecting reductions in the availability of STAT stimuli rather than biochemical effects on the STATs themselves. While this manuscript was in press, there were two additional publications describing STAT3 gain-of-function patients and their diverse autoimmune phenotypes (78, 79). The Jak/STAT pathway is a fascinating case study of how basic science can be parlayed into clinical gains, first by strengthening our understanding of human disease and then by informing the development of targeted therapeutics. Beyond these pragmatic ends, the study of Jak/STAT signaling continues to yield transformative insights about the nature of cellular communication and the regulation of gene expression. Befitting its ascendant status, the impact of Jak/STAT is now felt beyond immunology in a number of emerging fields, including stem cell biology and metabolomics, thus setting the stage for the next phase of research to meet the lofty standard set in the past two decades. J.J.O. and the National Institutes of Health hold patents related to therapeutic targeting of Jaks and have a Collaborative Research Agreement and Development Award with Pfizer. We regret that, due to space constraints, many relevant publications were omitted from this review.
. 2012. Comparative evolutionary genomics of the STAT family of transcription factors. JAK-STAT 1: 23–33.
. 2014. Mechanism of activation of protein kinase JAK2 by the growth hormone receptor. Science 344: 1249783.
. 1996. Activation of STAT4 by IL-12 and IFN-alpha: evidence for the involvement of ligand-induced tyrosine and serine phosphorylation. J. Immunol. 157: 4781–4789.
. 2003. The IL-27R (WSX-1) is required to suppress T cell hyperactivity during infection. Immunity 19: 645–655.
. 1995. Spacing of palindromic half sites as a determinant of selective STAT (signal transducers and activators of transcription) DNA binding and transcriptional activity. Proc. Natl. Acad. Sci. USA 92: 3041–3045.
. 2011. Genomic views of STAT function in CD4+ T helper cell differentiation. Nat. Rev. Immunol. 11: 239–250.
. 2012. Transcriptional and epigenetic control of T helper cell specification: molecular mechanisms underlying commitment and plasticity. Annu. Rev. Immunol. 30: 707–731.
. 2012. The Stat3/GR interaction code: predictive value of direct/indirect DNA recruitment for transcription outcome. Mol. Cell 47: 38–49.
. 2010. Discrete roles of STAT4 and STAT6 transcription factors in tuning epigenetic modifications and transcription during T helper cell differentiation. Immunity 32: 840–851.
. 2012. Genome-wide analyses reveal the extent of opportunistic STAT5 binding that does not yield transcriptional activation of neighboring genes. Nucleic Acids Res. 40: 4461–4472.
. 2013. Comprehensive meta-analysis of Signal Transducers and Activators of Transcription (STAT) genomic binding patterns discerns cell-specific cis-regulatory modules. BMC Genomics 14: 4.
. 1997. GAS elements: a few nucleotides with a major impact on cytokine-induced gene expression. J. Interferon Cytokine Res. 17: 121–134.
. 2013. STAT5 outcompetes STAT3 to regulate the expression of the oncogenic transcriptional modulator BCL6. Mol. Cell. Biol. 33: 2879–2890.
. 2013. The cytokines IL-21 and GM-CSF have opposing regulatory roles in the apoptosis of conventional dendritic cells. Immunity 38: 514–527.
. 2011. Opposing regulation of the locus encoding IL-17 through direct, reciprocal actions of STAT3 and STAT5. Nat. Immunol. 12: 247–254.
. 2014. A role for the ITAM signaling module in specifying cytokine-receptor functions. Nat. Immunol. 15: 333–342.
. 2014. The adaptor TRAF5 limits the differentiation of inflammatory CD4(+) T cells by antagonizing signaling via the receptor for IL-6. Nat. Immunol. 15: 449–456.
. 2011. 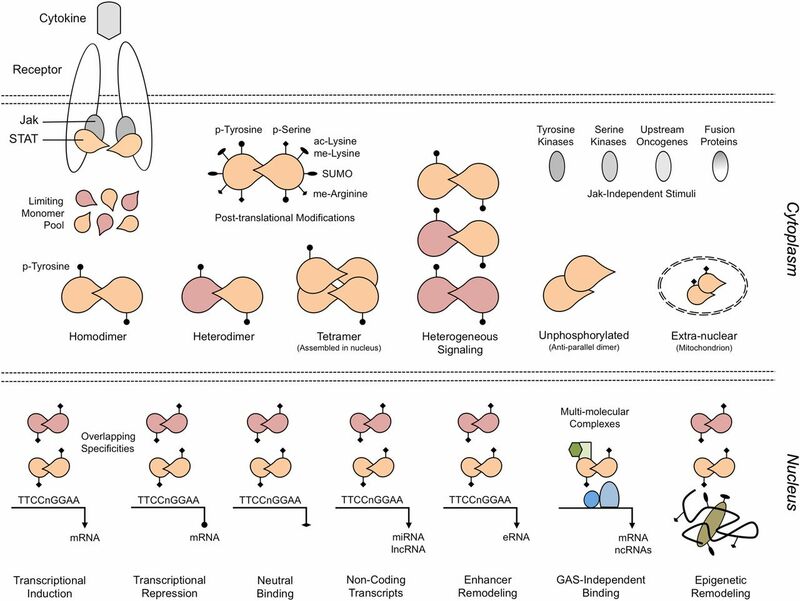 Charting histone modifications and the functional organization of mammalian genomes. Nat. Rev. Genet. 12: 7–18.
. 2009. Epigenetic control of T-helper-cell differentiation. Nat. Rev. Immunol. 9: 91–105.
. 2011. Epigenetic repression of the Igk locus by STAT5-mediated recruitment of the histone methyltransferase Ezh2. Nat. Immunol. 12: 1212–1220.
. 2008. Integration of external signaling pathways with the core transcriptional network in embryonic stem cells. Cell 133: 1106–1117.
. 2012. A validated regulatory network for Th17 cell specification. Cell 151: 289–303.
. 2010. Nonconventional initiation complex assembly by STAT and NF-kappaB transcription factors regulates nitric oxide synthase expression. Immunity 33: 25–34.
. 1998. Transcription factor-specific requirements for coactivators and their acetyltransferase functions. Science 279: 703–707.
. 2009. Analysis of interleukin-21-induced Prdm1 gene regulation reveals functional cooperation of STAT3 and IRF4 transcription factors. Immunity 31: 941–952. 2010. Maintaining cell identity through global control of genomic organization. Immunity 33: 12–24.
.; NISC Comparative Sequencing Program, . ; National Institutes of Health Intramural Sequencing Center Comparative Sequencing Program Authors, . ; NISC Comparative Sequencing Program Authors. 2013. Chromatin stretch enhancer states drive cell-specific gene regulation and harbor human disease risk variants. Proc. Natl. Acad. Sci. USA 110: 17921–17926.
. 2012. STATs shape the active enhancer landscape of T cell populations. Cell 151: 981–993.
. 2013. Expression and regulation of intergenic long noncoding RNAs during T cell development and differentiation. Nat. Immunol. 14: 1190–1198.
. 2010. Regulation of microRNA expression and abundance during lymphopoiesis. Immunity 32: 828–839. Kohanbash, G., and H. Okada. 2011. MicroRNAs and STAT interplay. Semin. Cancer Biol. 22: 70–75.
. 2014. The STAT3-binding long noncoding RNA lnc-DC controls human dendritic cell differentiation. Science 344: 310–313.
. 2012. Critical role of STAT5 transcription factor tetramerization for cytokine responses and normal immune function. Immunity 36: 586–599.
. 2014. STAT1-cooperative DNA binding distinguishes type 1 from type 2 interferon signaling. Nat. Immunol. 15: 168–176.
. 2007. High basal STAT4 balanced by STAT1 induction to control type 1 interferon effects in natural killer cells. J. Exp. Med. 204: 2383–2396.
. 2000. Essential role of signal transducer and activator of transcription (Stat)5a but not Stat5b for Flt3-dependent signaling. J. Exp. Med. 192: 719–728.
. 2012. Pyruvate kinase M2 regulates gene transcription by acting as a protein kinase. Mol. Cell 45: 598–609.
. 2011. Activation of STAT6 by STING is critical for antiviral innate immunity. Cell 147: 436–446.
. 2013. CDK8 kinase phosphorylates transcription factor STAT1 to selectively regulate the interferon response. Immunity 38: 250–262.
. 2002. STAT4 serine phosphorylation is critical for IL-12-induced IFN-gamma production but not for cell proliferation. Proc. Natl. Acad. Sci. USA 99: 12281–12286. 2004. Essential role of STAT3 in postnatal survival and growth revealed by mice lacking STAT3 serine 727 phosphorylation. Mol. Cell. Biol. 24: 407–419.
. 2003. Phosphorylation of the Stat1 transactivation domain is required for full-fledged IFN-gamma-dependent innate immunity. Immunity 19: 793–802.
. 2010. Stat5a serine 725 and 779 phosphorylation is a prerequisite for hematopoietic transformation. Blood 116: 1548–1558. Meissner, T., E. Krause, I. Lödige, and U. Vinkemeier. 2004. Arginine methylation of STAT1: a reassessment. Cell 119: 587–589, discussion 589–590.
. 2005. Cell signaling. Stat acetylation—a key facet of cytokine signaling? Science 307: 217–218.
. 2013. Phosphorylation of EZH2 activates STAT3 signaling via STAT3 methylation and promotes tumorigenicity of glioblastoma stem-like cells. Cancer Cell 23: 839–852.
. 2010. Reversible methylation of promoter-bound STAT3 by histone-modifying enzymes. Proc. Natl. Acad. Sci. USA 107: 21499–21504.
. 2011. SUMO conjugation of STAT1 protects cells from hyperresponsiveness to IFNγ. Blood 118: 1002–1007.
. 2012. SUMO-specific protease 1 is critical for early lymphoid development through regulation of STAT5 activation. Mol. Cell 45: 210–221. Meier, J. A., and A. C. Larner. 2014. Toward a new STATe: the role of STATs in mitochondrial function. Semin. Immunol. 26: 20–28.
. 2009. JAK2 phosphorylates histone H3Y41 and excludes HP1alpha from chromatin. Nature 461: 819–822.
. 2013. JAKs and STATs in immunity, immunodeficiency, and cancer. N. Engl. J. Med. 368: 161–170.
. 2012. Inborn errors of human JAKs and STATs. Immunity 36: 515–528.
. 1993. Interleukin-2 receptor gamma chain mutation results in X-linked severe combined immunodeficiency in humans. Cell 73: 147–157.
. 1995. Mutations of Jak-3 gene in patients with autosomal severe combined immune deficiency (SCID). Nature 377: 65–68.
. 1995. Mutation of Jak3 in a patient with SCID: essential role of Jak3 in lymphoid development. Science 270: 797–800.
. 2014. A mouse model of HIES reveals pro- and anti-inflammatory functions of STAT3. Blood 123: 2978–2987.
. 2014. Activating germline mutations in STAT3 cause early-onset multi-organ autoimmune disease. Nat. Genet. 46: 812–814. 2013. Bringing genome-wide association findings into clinical use. Nat. Rev. Genet. 14: 549–558. 2008. Discovering susceptibility genes for asthma and allergy. Nat. Rev. Immunol. 8: 169–182. 2002. Stat proteins and oncogenesis. J. Clin. Invest. 109: 1139–1142.
. 2007. Role of JAK2 in the pathogenesis and therapy of myeloproliferative disorders. Nat. Rev. Cancer 7: 673–683.
. 2011. The pseudokinase domain of JAK2 is a dual-specificity protein kinase that negatively regulates cytokine signaling. Nat. Struct. Mol. Biol. 18: 971–976.
. 2009. Selectivity and therapeutic inhibition of kinases: to be or not to be? Nat. Immunol. 10: 356–360. Cosgrove, S. B., J. A. Wren, D. M. Cleaver, K. F. Walsh, S. I. Follis, V. I. King, J.-K. S. Tena, and M. R. Stegemann. 2013. A blinded, randomized, placebo-controlled trial of the efficacy and safety of the Janus kinase inhibitor oclacitinib (Apoquel®) in client-owned dogs with atopic dermatitis. Vet. Dermatol. 24: 587–597, e141–e142.
. 2012. Nucleic acid-based approaches to STAT inhibition. JAK-STAT 1: 285–291.
. 2014. Selective inhibition of the function of tyrosine-phosphorylated STAT3 with a phosphorylation site-specific intrabody. Proc. Natl. Acad. Sci. USA 111: 6269–6274.
. 2014. Autoimmunity, hypogammaglobulinemia, lymphoproliferation and mycobacterial disease in patients with dominant activating mutations in STAT3. Blood. DOI: 10.1182/blood-2014-04-570101.
. 2014. Early-onset lymphoproliferation and autoimmunity caused by germline STAT3 gain-of-function mutations. Blood. DOI: 10.1182/blood-2014-09-602763.